Low pressure: What will happen now? While entering the month of August, the northern areas (only) experienced the fifth monsoon spell that started from July 30 and lasted till August 2. The intensity of the fifth spell was weak due to the absence of westerlies. The highest rainfall during the 5th spell occurred in Kotli, Azad Kashmir that was 49 mm on July 31. Apart from the northern areas, the central as well as the southern parts of Pakistan remained dry with passing clouds coming from neighbouring India. Temperature across the country were around normal and no significant rise was seen the province of Sindh. *Western disturbance ’16′ was seen persisting over north-eastern Afghanistan and adjoining northern Pakistan as it moved eastwards. On August 3, it moved into northern areas and on August 5, it moved north-wards. *Upper air cyclonic circulations formed over north-west India on August 4. *Upper air cyclonic circulations formed on August 2 in the north-west Bay of Bengal, intensified into a low pressure at 1008 mbar the next day. On August 3, it moved slowly into the coast of West Bengal and Orissa. On August 5, it was seen over Jharkand and adjoining area. The Low pressure is not showing a mature track, although expected to weaken once it moves over central India and dissipate before affecting Pakistan directly. Some models indicate that the weather system would move towards south-western India that is Maharashtra, eastern Gujarat and adjoining Rajasthan (dissipating on August 8), somewhat closer to the seasonal trough near western coast while other show that the system would move towards north-north-westward India where it would dissipate. No matter which track it chooses, the low would send monsoon moisture to the eastern parts of the country. The sixth monsoon spell got a boost from the western disturbance ’16’ and since it has moved further into China, hence the monsoon spell has come to an amazing end. Mostly dry weather is expected till few days in the northern half including Islamabad however passing showers could occur in extreme northern areas. Fresh monsoon rainfall is expected in Islamabad, Lahore, Gujranwala, Sialkot, Rawalpindi, Peshawar, Murree, Muzaffaraad and other adjoining cities of the northern half from August 8 late/August 9. This spell could be weaker than the sixth spell depending upon the westerlies and monsoon moisture. Hence PWP on August 5, forecasts the chance of seventh spell to ‘high’, it would be upgraded. Another monsoon spell would also brew after the seventh. PWP forecasted on August 1, the fourth spell in the central areas (south Punjab) from August 4/August 5. However the rainfall has not occurred in the area till now despite witnessing heavy cloud presence in the western side. There are still chances of rainfall in South Punjab including Multan till 36 hours after that the conditions would dry up. As the northern parts would experience the seventh spell from August 8 late, during this period south Punjab could witness passing clouds with chances of drizzle/isolated shower. A proper spell of rainfall could be near the central parts on the middle of August. PWP on August 3 forecasted the third spell in some parts of Sindh from August 6/August 7 while PWP upgraded the chance of the spell from ‘poor’ to ‘moderate’ on August 5. The westerlies have once again started dominating the country, western winds along with the monsoon moisture coming from UAC (being fueled by the low pressure over east) have caused few thunderclouds to form over north-west Sindh that could bring some showers to the drought-hit parts. Hence there are chances of showers, mostly mild with fast winds in upper Sindh (Jacobabad, Sukkur, Larkana and few adjoining cities), while chances of drizzle/isolated shower in central Sindh (Hyderabad and Nawabshah), eastern Sindh (Mirpur Khas and Tharparkar) on August 6. Coastal Sindh including Karachi would remain dry with chances of drizzle. No bright chances yet! If same condition prevails till middle of August, then PWP fears that Sindh would start to enter a moderate version of drought that could be alarming. Five people died till July 31 in rain-related incident, the number has risen since 1 person died in Lahore while 3 died in Rawalpindi due to rain and winds since the monsoon death toll rises to 9. ← Beauty of Thar – Unsettled weather killing Peacocks in Sindh! Very very detailed forecast,,much much thanks to pwp that has enabled me to understand weather terminologies and forecast.. Continuous spells for upper Pakistan. Dry weather only for us. Even these continuous spells are still behind normal ! damn, 😦 I was so sure it would rain in Multan today keeping the last 2mm rain in mind that occurred due to interaction b/w western and eastern winds. Yesterday weather.com was showing 80% chance of rain but what happened today was just overcast conditions in the morning giving way to sun after noon. Did rain occur last night in Multan? there was a heavy cloud presence in W of South Punjab. Bawalnagar has received some showers..
Next spell is forecasted for Northern areas as soon as their current spell ends. w0w ! thanks Baber bhai your Knowledge Absolutely correct. @ K.M, No doubt, ALLAH bohut meherban hai Punjab/Khyber Aur Kashmir walo Per. @ K.M, I cannot understand this year monsoon behavior. IN 2008 also Monsoon was failed in Karachi but this year monsoon is worse than 2008 in Karachi. Even drizzle is not occurring for some minutes and i do not know that what kinds of clouds here in Karachi which are very slim and cannot give any rain? 2008 was a neutral year, this year EL NINO is active, also since last two years monsoon depressions in BOB have been missing..
Hmm, If we did’nt get a single drop of water which called blessing from allah then we would w8 for next monsoon season 🙂 dnt be sad public of karachi . pray for rain every thing will be good. Inshallah..
@Gohar. u r right. we should pray for rains in sindh and balochistan too. for punjab also. except this spell it didint rain enough in punjab. whereas islamabad, khyber and kashmir gets significant rains in winter also but most of punjab doesnt. @KM. yeh baat bhi ghalat ha sab ko Karachi ki rains se matlab ha. wesay bhi Karachi mein kon si rains hoti hein. Babar bhai bar bar keh chukay hein Karachi ka weather different ha aur arid ha wahan rains boht hi kam hoti hein. so Karachi k liye rains na hona is almost normal. worry ki baat yeh ha k rest of the country mein rains boht kam hui hein. Overall Sindh mein rains nahi hui,Punjab mein normal se boht kam hui hein,Khyber mein kam hui hein aur Balochistan mein shayad hui hi nahi. yeh baat ziada concern ki ha k rainy areas mein rains nahi hui. oh no lagta hai Mirpurkhas m last year jo rains hui thi woh 10 year tk k liye ho gai thi?? ?babar bhai kya Mirpurkhas m koi heavy spell nhi aay ga? Apart from the forecasted drizzle/isolated shower, there are no chances of heavy rainfall in Mirpur Khas anytime soon. plz all of you pray for rains in sindh. @ K.M, We can pray but we cannot do anything about this Western Disturbance which is No.1 Criminal behind dry and hot weather over Karachi and i have proof about it but you will not believe. Western Disturbance interaction with Easterly is only beneficial for upper Pakistan and Northern India, Srinagar Plus many other factors related to Western Disturbance and all are against Karachi and that’s why during winter also even by mistake it never gives rains to Karachi and Sindh. Western Disturbance is destroying South West Monsoon by interfering in it. I do not know why even in June, July and August Western Disturbance is active and almost whole year it is active in South Asia and destroying South West Monsoon. When monsoon is weak (like this year), its mostly the WDs that saves northern parts from going into a major drought..
Is their any chance of a good spell in sindh after august 15? Monsoon of 2013 will also be like this year’s monsoon. This blog is also educating people regarding environment protection, most of the people including myself visit this blog to know weather forecast meanwhile your articles regarding environmental issues help us to know more about environment and behavior of the weather. Love this blog. I was watching news where i come to know that some peoples in northern areas are selling glacier’s ice because there is energy crises in the country so people using this ice to cool their water, please write some thing about this to. Babar bhai ALLAH bless you. Thank you Tabish really much 🙂 , its always good to see people taking interest in such things. About the Glacier article, I really dont have much information about what is happening there apart from the fact that authorities have taken action against such people but too be honest I dont think so that cutting glacier is as dangerous as it is being portrayed in the media. I believe that cutting trees need more coverage than glaciers. Its even blessings of Allah in Karachi, that apart from the rest of whole country, if here is no rain than city’s temperature is bearable / moderate. Evening routine cool sea breeze of may & June are not found in any part of country except hilly areas , even then June,July,August are comparatively pleasant months as compared to whole country. This year only 2-3 days LOO blow here at just start of May, n then as usual from 2nd week of May temperature started dropping with average was 35, whole June was so windy, cloudy at 33C, & in July 5 to 6 days ago temperature of karachi was further dropped to 30C..yes, rains essential for water reservoirs to cover-up deficiency but Karachi remains cool even without rains. Notable point is this, Karachi’s temperature rises after rains usually from 33/34 to 38C, as E or NE starts blowing…..Indeed, western disturbances are killer of monsoon for Karachi.. same time, Geo-graphical location cannot be ignored. its also fact that rains started ending towards W of Karachi. The wettest line of Karachi is the coastline starting from E & ending to S, including Port.Qasim, Malir, Shahra-e-faisal surroundings, DHA,Clifton, MA Jinnah road surroundings, ……& W & N are comp drier side North Nazimabad, Orangi, baldia, New karachi received less rains as per previous rains record. ..Another notable thing is that South Karachi especially Clifton, tower sides usually get drizzling/sprinkling each night or with gap of 1 day, but rest of areas don-not experience it. Even today at 11pm, light drizzle occur on clifton beach. So, Karachi is a much big city, having inter-city weather variations also. Babar bhai your forecast is spot on. you forecasted showers with thunder/lightening in north punjab tonight and it happened. it showered with heavy thunder and lightening here in Gujranwala. Thunder/lightening continued for almost 2hrs and stopped at approx 3:15am. you are amazing and i believe your forecasts more than anyone else. in the afternoon cnn weather and free meteo weather were showing partly cloudy weather tonight for Gujranwala and changed their forecast late at night for thundershowers whereas you have forecasted this long before anyone else. you are spot on. 1. What is a “fresh” western disturbance? it means if there is a fresh western disturbance then there would also be a “non fresh” western disturbance. why we often call it a Fresh western disturbance? does it mean that ”fresh “western disturbance carries more moisture than a non fresh w.disturbance? Fresh WD simply means new WD. Winter and summer WDs are different. @ KM. i have observed some unusual weather or very very isolated weather system here in Gujranwala in past. sometimes it rains heavily with strong winds in a very very isolated area ,sometimes in a radius of 8km to 15km and if u move few km away either in any direction there is sunny and dry weather as if nothing is happening around and if u re enter that isolated area the rain will still be going on with winds and streets flooded with water. i want to ask from where does that wind come from and where does it go and from where do those clouds come and go as its dry and often sunny all around? is it due to the proximity of Kashmir mountains which are visible approx 20km north of Gujranwala? 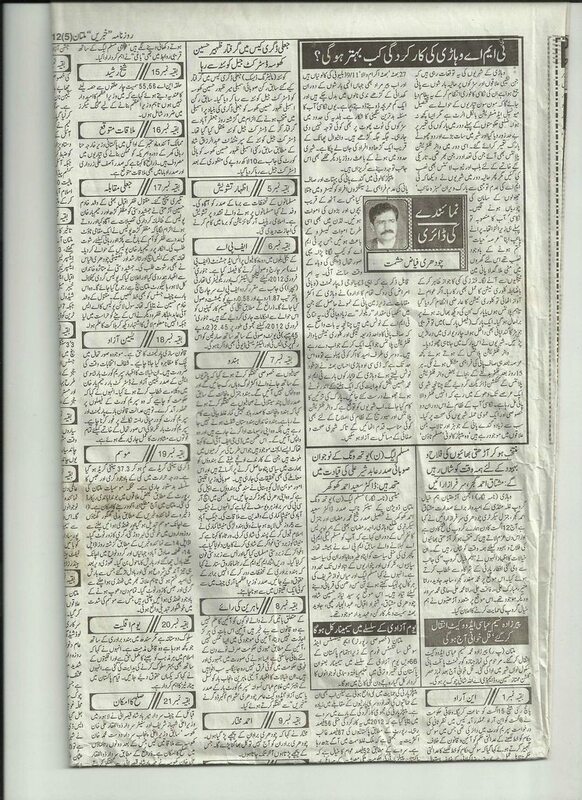 Such thing depends upon the size of the thundercloud, it happens every where in the world, sometime its a stray cloud that is dissipating and sometimes its a thundercloud that is expanding..
Sir today is 9 th august when u will publish past monsoon record of nawabshah? Hopefully on Sunday but do remind me again.. Thanks Babar bhai for responding to our queries. I request you to please include Gujranwala in your forecasts and the amount of rain that falls here because Its a large and important city in north punjab. Pakistan Meteorological Department and other sites issue forecasts for Gujranwala but i dont believe them. Your welcome Umar 🙂 and I would mentioned Gujranwala from now onwards. and many congratulations on the achievement of this milestone. PWP is really a reliable source and the world is recognizing it.Its really a big honour to find a place in such an authentic international news media source like “Washington Post” and you deserve all the credit for this. Please keep up the good work ALLAH’s help and our prayers are with you. Thank you very much Umar :D, Its a real big honour to be mentioned in the International press. assalam alaikum. ye jo spell sindh me aaega us ki intensity kya hogi? or us ka duration kitna hoga? kya wo spell hyderabad ko hit kare ga kya? hyderabad me rains ke chances hen ya nahe? lagta he is year jo 3mm rain hwi thi bas wahi hogi. ab rain nhe hogi. Walikum assalam, this spell seems mostly weak with very slim chance moderate falls, likely to affect NE and SE parts, partly/mostly cloudy with chances of drizzle in Hyderabad. Cant tell the exact amount of rainfall as it would very obviously. Less rains are very likely this year than 2011..
Good rains in lahore this august…August turning out to be above normal…Whats your forecast for rest of the month and if rains continued like this it will compensate for below normal rains in july…i think above 150 mm has already fallen not counting todays rain.. Healthy rains have occurred in Lahore since few weeks but still a lot more needs to pour to overcome the “negative” July. Unusual series of heavy downpours must occur in Lahore if it wants above normal rains during the remaining three weeks of August and two weeks of September. 2) Dry, Dry and Dry weather for Karachi and No Chance of Rains over Karachi. After seeing these two points in all weather updates our interest in forecast has lost as we know that Karachi is never going to have rains. @KM We received rain yesterday early in the morning around 7 AM of Aug 11. 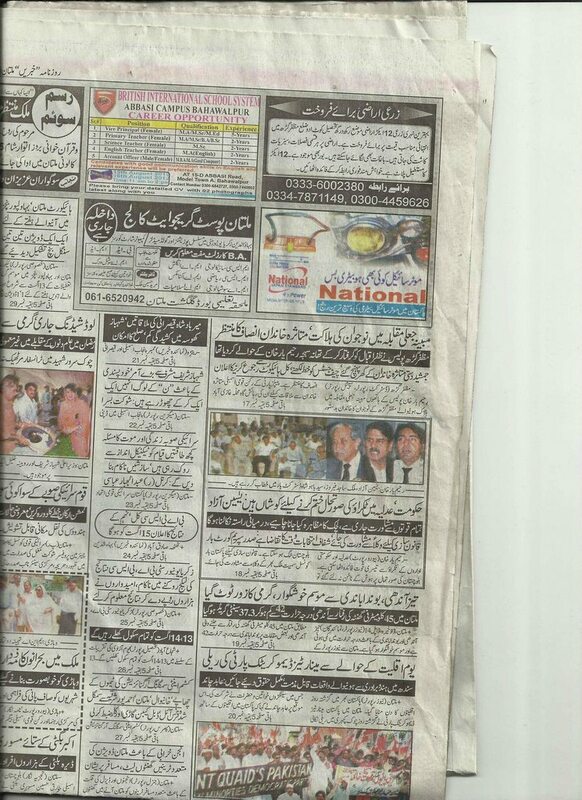 It was heavy and daily Khabrain also reported it today. But PMD didn’t write about it on their website! Hmmm, I am also little surprised at PMD, can you give a link from this newspaper? If rain has occurred in Multan then fifth spell has already hit the central parts. Oh Thanks! means that rain might have been recorded in other parts of south Punjab as well.. I have sympathies with Karachi people where it didnt rain this monsoon. its very sad. Atleast our upper punjab got rains. I hope Karachi will also get its share of rains in the remaining season INSHALLAH.
. Is there any difference b/w western disturbances that approach Karachi and that approach Upper Pakistan? There is no difference between the WDs. In short, Western winds have the habit of attracting everything towards it, WDs are game changer! kia tando muhammad khan me kisi significant rain ki prediction he?or kia ye jo spell aega wo tmk ko hit kare ga?or us weather system ki intensity kya hogi? 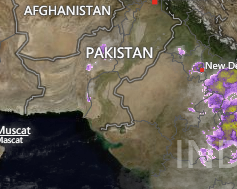 Fairly widespread thunderstorm/rain with HEAVY TO VERY HEAVY falls at scattered places is expected over upper catchments of rivers Sutlej, Ravi, Chenab and Jhelum along with North & Northeast Punjab. 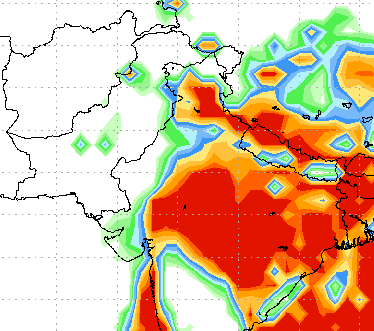 FFD Lahore is forecasting this for after 72 hrs…What is your forecast for the next few days? There is another (ninth) spell coming would look at its intensity in detail tomorrow..